Royal Challengers Bangalore successfully defended 218 runs to stay alive in the competition. IPL 2018, RCB vs SRH: Royal Challengers Bangalore successfully defended 218 on Thursday after Sunrisers Hyderabad failed to chase the target in Bengaluru. 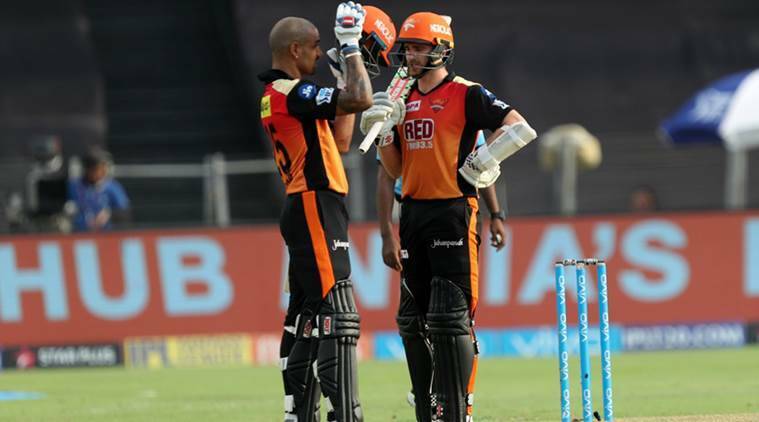 Chasing 219, SRH were off to a flying start before they lost openers Shikhar Dhawan and Alex Hales in quick succession. Later, captain Kane Williamson took on the onus on himself and hammered 81 runs before getting out in the last over. Manish Pandey too chipped in with an unbeaten half-century but in a losing cause. SRH needed 20 runs from the lat over but Siraj was clinical in the last over as he didn’t leak runs. Earlier, Royal Challengers Bangalore posted 218/6 against Sunrisers Hyderabad. Riding on an emphatic partnership between Moeen Ali and AB de Villiers and some power-hitting from Colin de Grandhomme in the death overs, RCB compiled a massive total against SRH. Sunrisers on the other side were sloppy in the field as they dropped catches and gave away few boundaries. Royal Challengers beat Sunrisers Hyderabad by 14 runs. "I think if we are honest, we missed the trick a little bit with the ball. RCB were fantastic in batting, put us under pressure from ball one and got a good total. When you're chasing, a lot needs to go your way and you need to make very good decisions. At key times towards the end, the runs didn't come. The boys fought hard, and we'll move forward from this. (Thoughts during the innings break) The surface here is tough generally; today was a good wicket obviously. It was important for us to not get carried away early on. The ball flies at this ground, so you can make up. We were close but not close enough. (On what he's done about his consistency) It's about playing your role for the team, as well as you can. We played on a number of tough wickets. We have to find that balance and get some momentum. Credit to RCB again; they deserve to win. They bowled nicely towards the end," Willaimson said after the match. That's all from our side for this match. The Royal Challengers Bangalore skipper Virat Kohli is the culprit here. It should have been taken and Hales would have been walking back in the hut but instead he is hammering RCB bowlers around the park. That was fabulous entertainment. Every ball an event. Surely #RCB have enough. #MI and #KKR will be watching the #SRH response very closely! Sunrisers Hyderabad will feel that they have something to prove after the loss against Chennai Super Kings in their previous encounter. The side will look to bank upon the form of the opening batsman Shikhar Dhawan and the skipper Kane Williamson, who both scored two back-to-back fifties, and have stitched 100 runs partnership twice in a row. If Royal Challengers Bangalore wish to keep themselves into the match, not only they would need to be smart against the feroicious SRH bowling line up featuring the likes of Rashid Khan, Bhuvneshwar Kumar, but they would also have to find a way to dismiss Dhawan and Williamson. The longer the two stay in the middle, the more stronger SRH will get, and RCB cannot afford to slip up. 1 IPL 2018, RCB vs SRH: How a Royal Challengers Bangalore win can affect playoffs scenario?